Rosehill TPV is the only one of its kind in rubber wetpour. Made from premium quality virgin polymers, combined with the highest possible UV stabilized pigments so as to retain its colour, even in our harsh Australian climate. ROSEHILL TPV has been specifically designed with the end user in mind and is a proven and cost effective alternative to current rubber granules in the market place. Globally it is the product of choice by highly specialised installers for use within the Sports and Play industries. No longer merely limited to sports and play, TPV now joins the world of super models and movie stars… the possibilities are endless and are only limited by the confines of your imagination! TPV INFILL is a high performance rubber granule for synthetic turf pitches which conforms to FIFA 2 star standard. Overall a highly innovative development offering excellent UV resistance, free from heavy metals, environmentally friendly and totally versatile within all artificial grass systems. A fully flame retardant grade is available. TPV INPLAY is the next generation rubber granule for indoor and outdoor bonded sports and play areas. 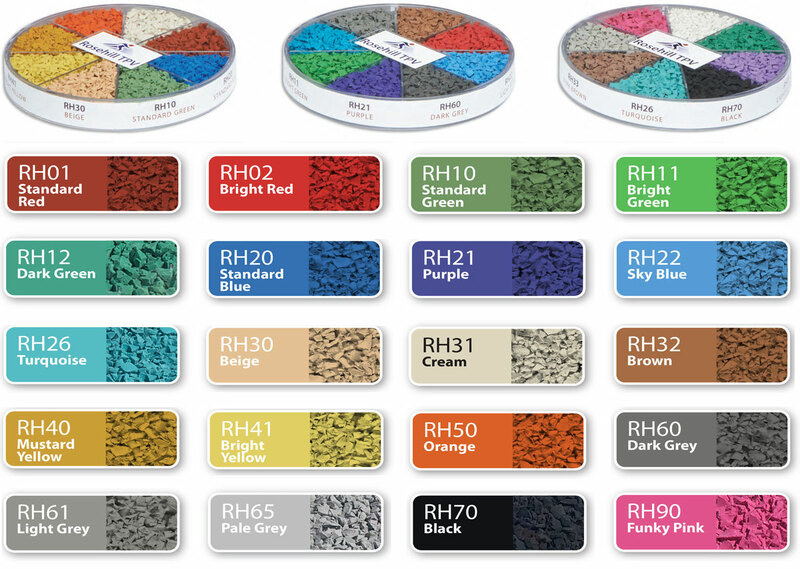 It offers much better colour consistency throughout, and superior UV stability to EPDM and colour coated SBR granules. It is currently available in a range of over 24 colours and offers both architects and installers endless possibilities for creative design when planning wet pour surfaces. TPV INSPORT is a rubber granule commonly used in anti-skid and structural spray systems for sports surfacing. It has been tested within our structural spray coat FLEXI SC. More recently becoming a popular choice for splash areas, pool decks and water parks. Welcome to Viva Grass! We are installers and suppliers of synthetic grass servicing all areas of Perth, Western Australia. Synthetic grass is the best solution to keep your environment fresh and green all year round. Viva Grass specialize in residential, commercial artificial lawns and professional putting greens.